Main Street westward from Evanston has all sorts of interesting things on and around it. 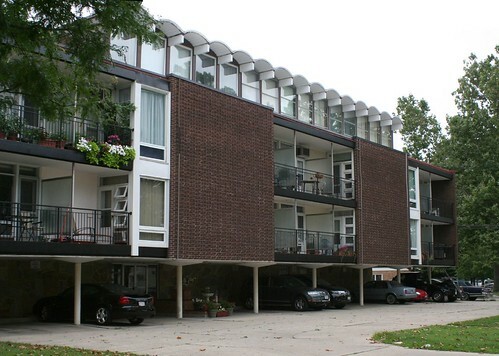 My favorite bit may be this trio of buildings in the 3400 block, in Skokie. 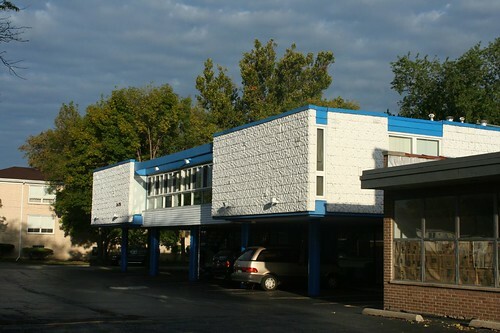 They sit in a sea of Midcentury buildings – raised ranches on the surrounding streets, and 1950s shopping strips, with little 1-story commercial buildings like these across the street – the kind with stacked bond Roman brick and big plate glass storefront windows set at a slight angle from the sidewalk. First is this 2-story building at 3400 W. Main Street, designed as if it were a California ranch house – low pitched roof, overhanging eaves, glassy front walls. 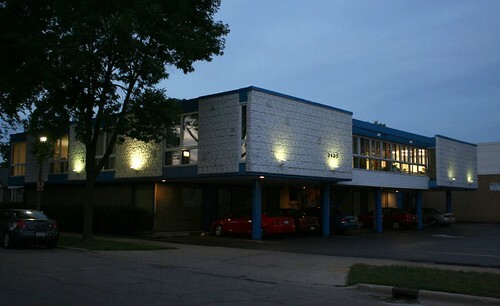 The building was finished in 1957, as commercial offices. 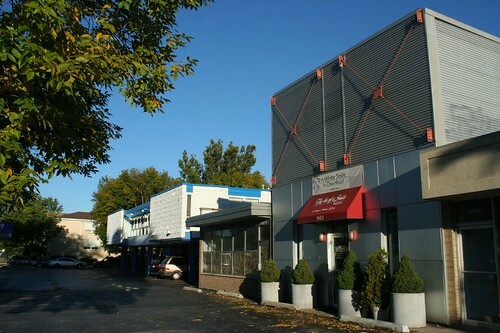 Second is this contemporary structure, a modern metal building with a shipping container aesthetic, at 3412 W. Main Street. It’s home to a dentist’s office. There was a home builder at this address in the 1960s, but I doubt the building is any older than 1985. CityNews dates it to 1991. 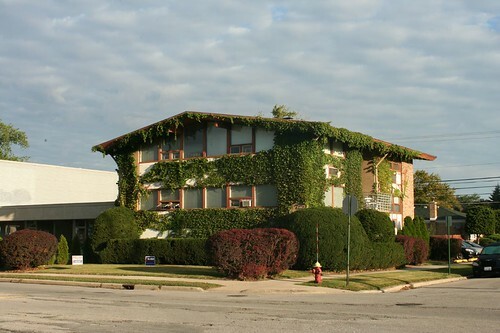 The most interesting is 3420 W. Main Street. Tribune ads identify this address in 1963 as home to Palco Builders, who were constructing California-style ranches out west in Lincolnwood and pulling in enough money to show up on the paper’s list of million-dollar sellers. By 1966, a tax service had appeared at the same address. Today it’s home to the Knowledge Systems Institute. 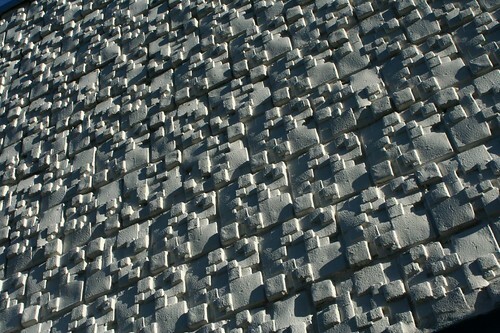 But when you look close, you’ll find that the entire facade is covered with textile patterned concrete blocks. If I had to take a stab at the building’s parti – the big overriding idea that the designer had in mind – I’d call it a sort of ancient temple that an Alan Quatermain adventurer type (or Indiana Jones, but that character didn’t exist in 1963) might stumble across in some South American jungle. 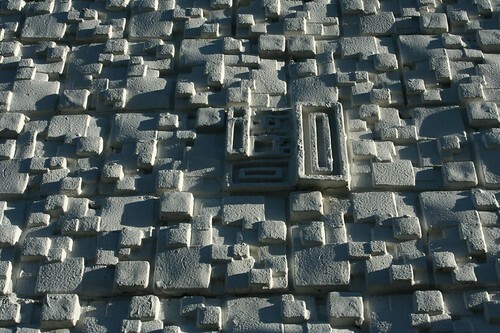 Pull the lever, and the stone facade creakingly splits and slides open to reveal the techno-wonderland within! Notice that everything in the facade opening is set back, and it’s all glass and metal. There’s even a top and bottom “rail” for the “doors” to slide on, visually speaking. 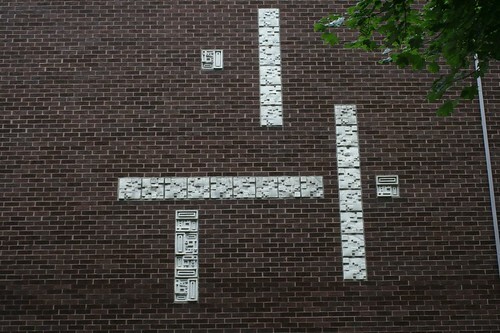 These are the same blocks that I’ve written about on a couple of occasions. I still haven’t discovered where they come from. 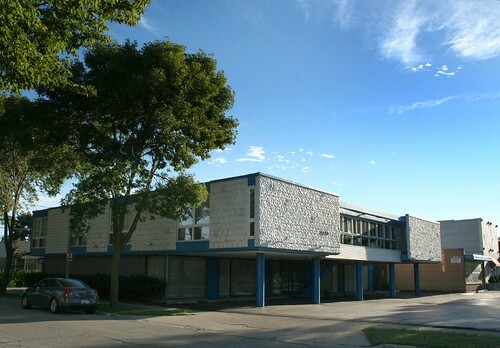 I have, however, found one other building that makes use of them, out west at 6121 W. Higgins Avenue. Not quite as mind-blowing, but still interesting! 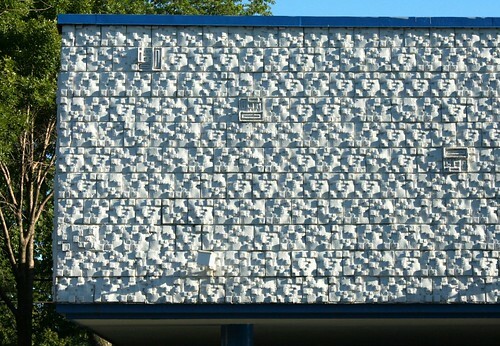 On this 1963 apartment building, they appear as a decorative element on the major facade. 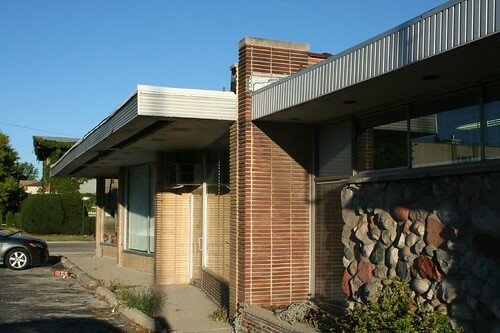 This entry was posted in Contemporary Modernism, Mid-Century Office and Commercial, Mid-Century Retail and Storefronts, Midcentury Modernism, Skokie. Bookmark the permalink.